The easiest way for someone to steal your identity is online or through your PC. Laptop security locks are a good way to protect yourself if you use a laptop, especially if you carry it with you or live in a dorm or apartment area. It may be easy to fall into the trap of thinking identity theft occurs through the internet (which is true), but don't forget that hackers have means of obtaining access to the personal information stored on your laptop. One way they do this is through the use of spyware-software that is secretly installed to collect personal information stored on your computer and can also be used to install other software or change settings on your computer. It can also track your internet habits. Spyware can be installed if you leave your laptop or PC unattended and it can also be installed via the internet. This type of thing can easily happen on a shared computer or a laptop in a shared space -- another good reason to keep yourself protected with a security lock on your laptop. The average price for most laptop security locks is $20 but can go up to $50. Before you actually purchase a lock, check your laptop to make sure it has a USS (Universal Security Slot). The cord part of the lock goes around a sturdy, stable object while the lock is inserted into the USS (make sure you hear a click when you push it in). What about bolt cutters? So maybe these locks won't keep those types out, but the average casual passerby, visitor in your dorm room, or nosy apartment neighbour will be deterred. 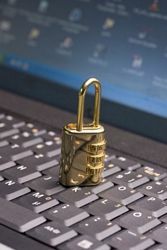 Having a laptop security lock helps as long as you are staying in one place, but what about when you are on the move? For travel and commuting you can't strap your laptop down, but you can keep it close by your side. Make sure you have a suitable carrying case for your laptop and NEVER let it leave your side. That way, either at home with your laptop or while you are in transit with it, you have a greatly reduced chance of becoming the victim of identity theft. Have a Great Story or Tips to Share About Laptop Security Locks ?